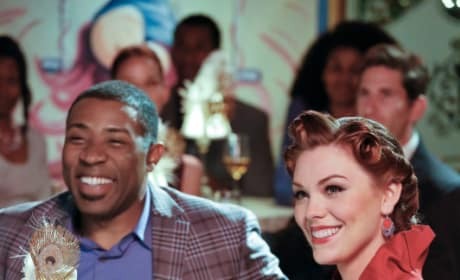 Looks like a little cabaret helped make Lavon smile once again on Hart of Dixie. "Star of the Show" is the tenth episode of the show's third season. Has Annabeth convinced Lavon to fight the merger one last time on Hart of Dixie? "Star of the Show" is the tenth episode of the show's third season. Lynly isn't happy that George and Tansy are getting closer on Hart of Dixie. "Star of the Show" is the tenth episode of the show's third season. AnnaBeth does her best to cheer up Lavon on Hart of Dixie. "Star of the Show" is the tenth episode of the show's third season. Lavon is feeling down about the Fillmore merger on Hart of Dixie. "Star of the Show" is the tenth episode of the show's third season. Joel and Zoe enjoy the cabaret on Hart of Dixie. "Star of the Show" is the tenth episode of the show's third season. [About Lynly] Little miss crazy eyes! Have you not seen my outfit? Polka-dot blouse and leopard print skirt, I mix patterns! I am an "outside of the box" thinker.